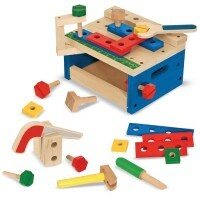 Build, play, create things with your own hands and this realistic Hape Toys Master Workbench Wooden Playset for Kids. 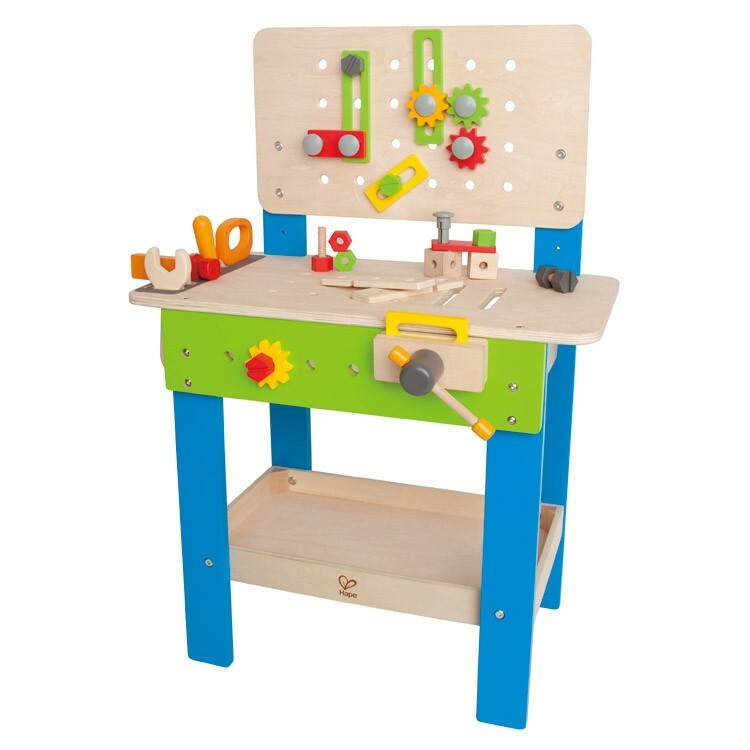 Little builders with big ideas can work right at this professional-looking station, Master Workbench Wooden Playset for Kids by Hape. 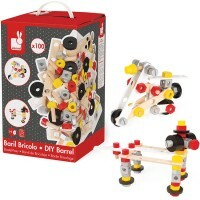 This kids work table set is really amazing. 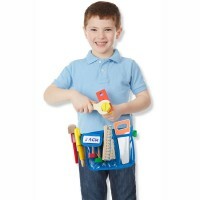 The workbench comes with shelves, storage space to keep all their tools and work supplies within reach. 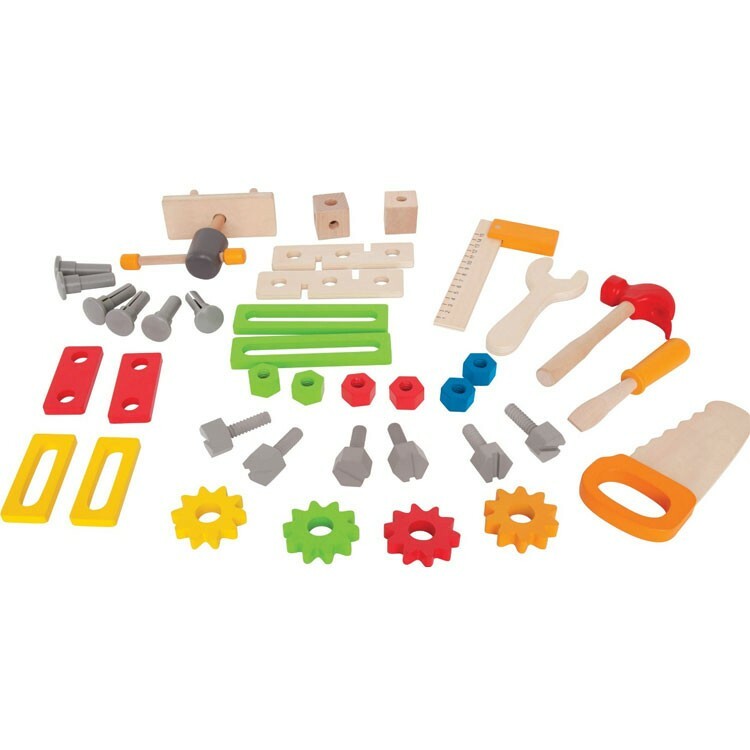 The Master Workbench set includes 32 pieces to make your child's woodworking fun: gears, colorful wooden building parts, wooden tools, nuts, bolts and more. 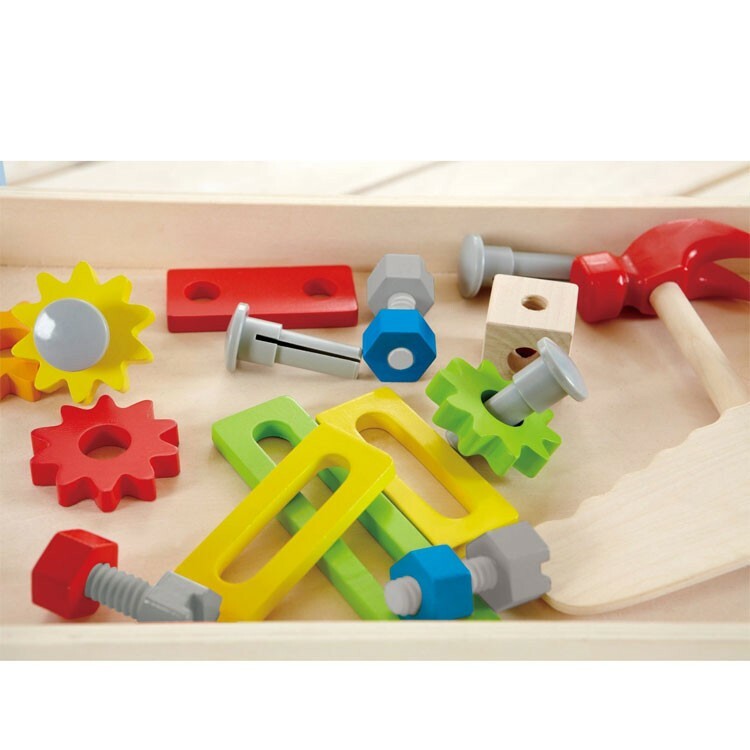 The Master Workbench Wooden Playset for Kids develops manual dexterity, problem solving, spatial thinking, creativity and responsibility for preschoolers and up. 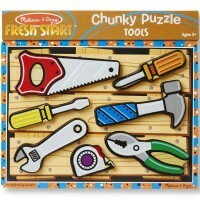 This great imaginative play set will make the children feel very proud abut their woodwork and other tool projects. The workbench set from Educational Toys Planet is well-made with wood, water based paint, 100% safe for children. 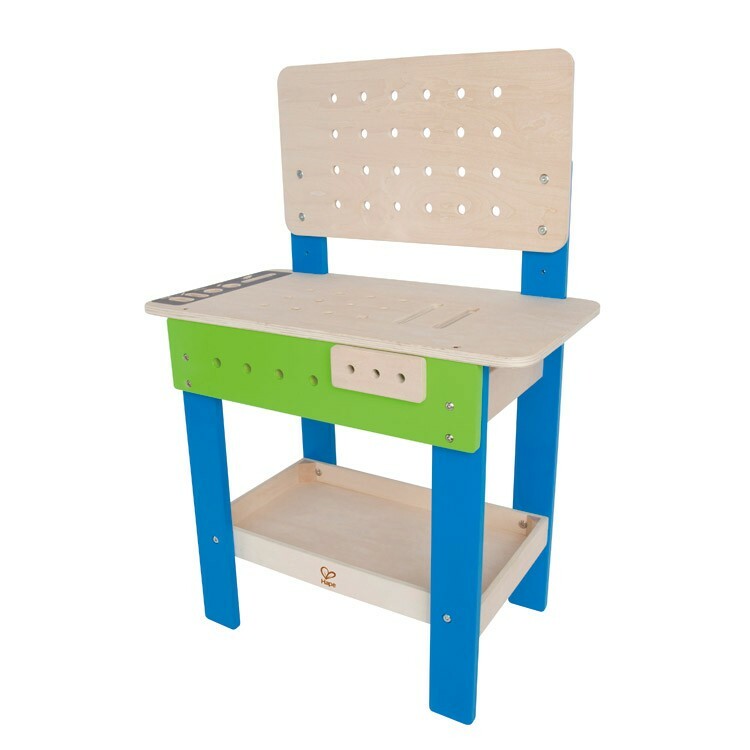 Hape's famous hand-crafting quality is the best warranty for this children workbench. Assembled workbench measures 21.7 x 11 x 32 inches. 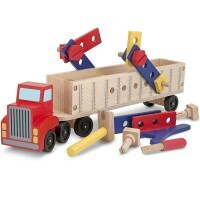 Dimensions of package 11.06" x 21.65" x 31.77"
Write your own review of Master Workbench Wooden Playset for Kids. 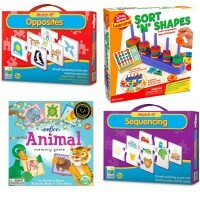 Rating: 5 Great Kids Toy by Hape Toys I looked at several options for our son and this one was definitely the right choice. I like that is focuses on the function of the toy, to teach kids, rather than having an overwhelming amount of flashy colors or useless ‘extras’. Rating: 5 Toddler fun! 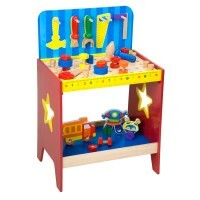 by Hape Toys My 2.5 year old son loves this work bench! It’s held up really good and was easy to put together. Rating: 5 Best purchase by Hape Toys Keeps my little guy busy for hours. He is learning so much to improve his fine motor skills. 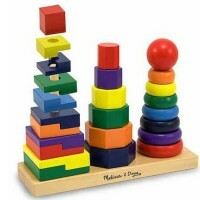 Rating: 5 Well made and safe by Hape Toys Grand daughter loved it and is only 18 months! Rating: 5 Boys and Girls love it. 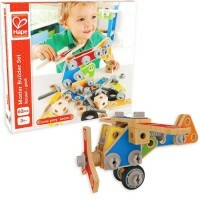 by Hape Toys I bought this for my two-year old grandson for Christmas, but both he and my four-year old granddaughter played with it more than any other toy at Christmas. The goggles are great to make the "little worker" feel the part. The bench and tools are made of sturdy wood. The only problem is that he lost the drill the first day and we have never found it yet. Rating: 5 Great addition to our play room by Hape Toys I got this for my son for Christmas and he and my daughter play with it every day!! Win!! Rating: 4 My two year old doesn’t care for it. 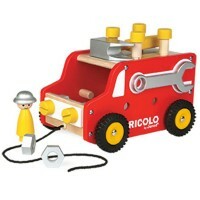 by Hape Toys Not sure if my son is just too young, or if there isn’t enough for him to do with this. I expected him to love this but it’s kind of just sitting in the corner.